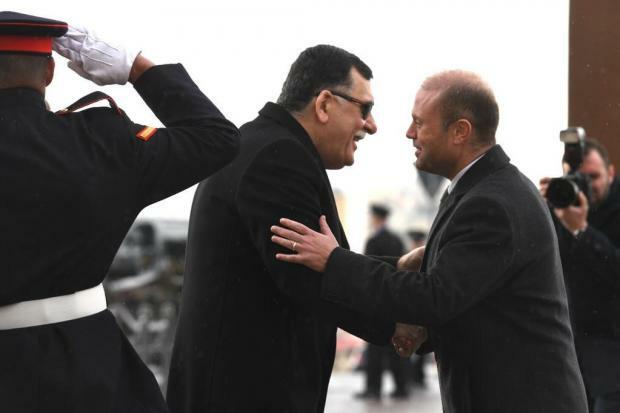 Updated 1.35pm - The Libyan coastguard should be allowed to do its job, Prime Minister Joseph Muscat said on Wednesday after having talks in Valletta with Libyan Prime Minister Fayez al-Serraj. No details about the talks were issued, but migration and bilateral relations were at the top of the agenda. It was the first meeting between the two leaders since they met for a conference on Libya hosted by the Italian government in Palermo in November. They greeted each other warmly on the steps of the Auberge de Castille before proceeding inside for talks that were expected to focus on the unstable situation in Libya, the aftermath of the Palermo conference, the migration situation and bilateral relations. Asked for comments after the meeting, Dr Muscat told the press that the level of commitment from the Libyan side to tackle migration had grown exponentially over the past year. This was in part due to input of the EU and help from Italy when it comes to patrolling of the territorial waters. “Once the EU is helping Libya finance, set up and train its coast guard, and this coast guard is finally functioning, we need to allow the Libyan coast guard to do its job. It’s not a race of who comes first when it comes to territorial waters… They should be allowed to coordinate a rescue. I don’t think it’s on that organisations think that they can decide rules for themselves. Those accompanying Dr Muscat at the talks included Deputy Prime Minister Chris Fearne and ministers Michael Farrugia, Chris Cardona, Konrad Mizzi and Carmelo Abela. Former Foreign Minister Alex Sceberras Trigona, who has served as Dr Muscat's envoy, is also present. The migrants exodus from Libya has put pressure on Italy and Malta, with both countries seeking to have the migrants distributed among other EU countries while refusing to open their harbours to rescue ships operated by NGOs. Times of Malta had reported in December that government employee Neville Gafà, in November had had a meeting in Libya with one of the country's most notorious militia leaders. It was not clear whether he had represented the government on that trip and he played it down as “nothing serious”. But Prime Minister Muscat subsequently said Mr Gafa was doing “very good work”. Prime minister Fayez al-Serraj is based in Tripoli and leads a UN-recognised government which, however, has limited authority over the country. The Palermo summit had been meant to assemble Libya's main rivals for the first time since a similar event in Paris in May last year, when they had agreed to hold elections in December. But al-Serraj's main rival, General Khalifa Haftar, whose government is based in the east of Libya, did not attend the conference, although he visited Palermo and had a meeting there with Italian Prime Minister Conte. The elections were not held. Serraj's western-based government has struggled to assert its authority in a country still mostly controlled by armed groups, almost nine years after NATO-backed rebels toppled former dictator Muammar Gaddafi. Libya also has two parliaments based in the east and west and has been beset by violence by the various militias which has seen its airports and oil fields frequently shut down. UN Libya envoy Ghassan Salame said late last year that he hoped another attempt to hold an election will take place by June but Libyans should first hold a national conference in early 2019 to decide on the poll's format. The envoy said the national conference should "preferably" take place on Libyan soil. Surveys had shown that 80 percent of Libyans want elections to end the stalemate between Libya's rival administrations.